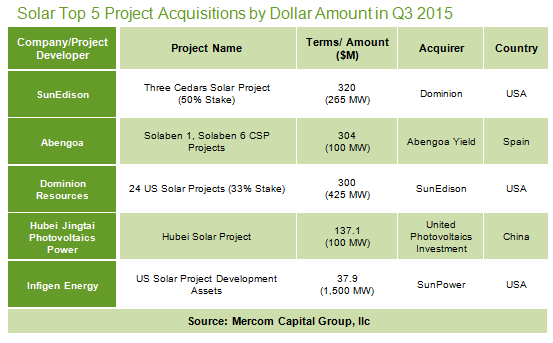 Total corporate funding for the global solar sector in the year’s third quarter reached $6.2 billion, according to Mercom Capital Group. 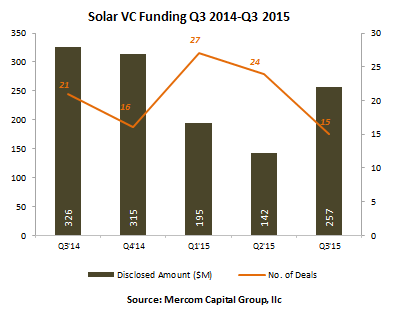 Mercom Capital Group is one of the world’s leading energy communications and consulting firms, and releases a quarterly funding and merger & acquisition report for the solar sector, which covers venture capital (VC) funding, public market, and debt financing. According to Mercom, global corporate funding was up from Q2’s $5.9 billion to $6.2 billion. Breaking it down, VC funding in Q3 was up to $257 million across 15 deals, compared to $142 million over 24 deals in Q2. Specifically, solar downstream companies accounted for 7 of those deals, amounting to $114 million. Public market financing dropped 28% in Q3 compared to Q2, dropping from $2.3 billion over 12 deals down to $1.8 billion over 8 deals, focused primarily in three IPOs which together raised a total of $930 million: SunEdison subsidiary TerraForm Global raised $675 million; Sunrun raised $250.6 million; and Grenergy Renovables raised $4.2 million. “With yieldcos falling out of favor, their fundraising in the public markets fell by half this quarter to $802 million,” explained Prabhu. Debt financing grew in the third quarter, growing from $3.4 billion in Q2’15 to $4.1 billion, dominated by Chinese companies debt financing activity, which accounted for well over half with $2.9 billion. Residential and commercial solar funds dropped for the first time after two record quarters of growth, down to $997 million in five separate deals, while there were 22 corporate merger & acquisition (M&A) transactions in Q3, compared to 17 in Q2 — with downstream solar companies accounting for 12 of them in the third quarter. Large-scale solar project acquisition totaled $1.2 billion in the third quarter, with 3.9 GW changing hands over 42 projects. This, compared to 66 transactions totaling $2.9 billion in Q2.